The C.A 757 voltage tester is the ideal device for electricians, heating and air conditioning engineers, mechanics, service technicians, etc. 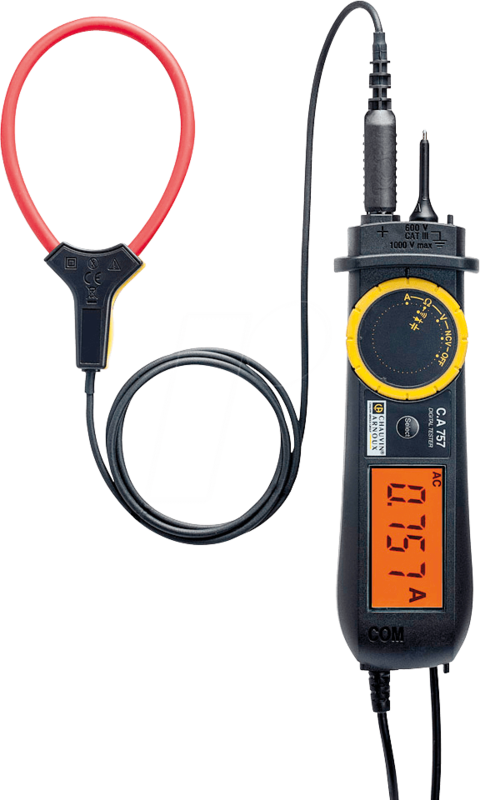 With 600 V CAT III, the C.A 757 complies with the IEC 61010-2-033 multimeter standard. It has the basic functions voltage measurement and continuity test, as well as the more specific multimeter functions resistance and capacitance measurement, as well as diode test. Thanks to its SMART function, the CA 757 automatically detects AC and DC voltages, as well as resistors, diodes and capacitors. Each CA 757 comes with a flexible MiniFlex® current transformer that measures currents up to 300A even in hard-to-reach places can be.